AUSTIN, Texas – The first Lotus Evora delivery in North America tookplace yesterday at John Eagle European’s Lotus of Austin when dealer principal Sonny Morgan handed Austin-area resident Bruce Rice the keys to his brand new 2010 Lotus Evora 2+2 sports car. Lotus of Austin hosted a party to commemorate the first delivery yesterday evening inside the dealership. 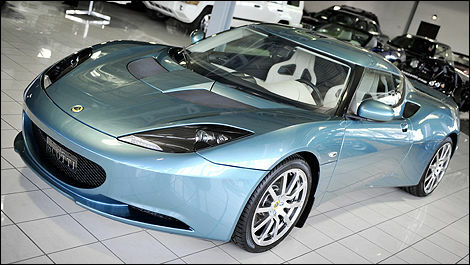 Lotus of Austin offers the full range of Lotus sports cars, including the Evora, Elise and Exige. The Evora is the world’s only mid-engine, four-seat sports car. Powered by a Lotus-tuned 3.5-liter V6 engine producing 276 hp, and weighing just over 3,000 pounds, the Evora offers breathtaking performance. Only a couple thousand Evoras will be built for the world each year, so the car will exude an exclusivity that matches its performance and stylish good looks. In addition to its excellent performance and exemplary handling, the Evora offers a refined ownership experience. Highlights include a contemporary, hand-crafted and elegantly trimmed cabin, as well as an equipment list with such high-tech features available as an advanced touch-screen multi-media system incorporating a state-of-the-art Alpine satellite navigation and audio system. The new Evora is not only suited for carving up the hill country roads, but can also very comfortably serve as an everyday driver.